What is Included in the TruSky eBay Design Package? A logo you can use not only on your eBay Store, but business cards, letter head, signs and other print media. Consisting of a Header, Banner, Cross Promotion Features, Custom Navigation, Promotional Items, and Custom Footer. Your home or index page that shows off your featured or top selling items and serves as an Organized and clear entry way to your product catalog. And completely compatible with mobile devices, which make up almost 50 percent of eBay shoppers!!! Custom Listing Manager: Each customer receives a custom listing manager. Which is a tool that allows the seller to develop new listings within their custom listing template with little effort, and zero knowledge of HTML. Each custom manager is built based on your specifications and allows you to create listings in a snap. This manager is available to you as a client, and you can access it through our client login. Why Should I Open an eBay Store? The reason you should open an eBay Store is the same reason why millions already have. The market. eBay is a Goliath in the landscape of eCommerce. From home merchants to Fortune 500 companies. Online sellers flock to eBay because in order to remain competitive they don’t have a choice. The market is too expansive to ignore. About 10% of all eCommerce that happens, happens on eBay. That’s why some of our clients, even companies with reputable and successful eCommerce websites are creating platforms and channels on eBay. Why Should I Create A Custom Designed eBay Store? Millions of people sell on eBay. In order to be successful you need three elements. In demand products, competitive pricing, and credibility. We can’t help you with the first two but we are masters in the last. A professionally built eBay presence serves to increase a buyer’s confidence in the seller. Consider this the following; all things being equal including cost, and relative number of feedback, which merchant do you purchase from: A) A seller with a default eBay Store and basic or bland pre-chosen template giving the appearance of an amateur merchant with little or no investment in their operation. OR B) A seller with a professional appearance, a sharp, crisp and modern eBay platform that was obviously created by a professional. A credible image will increase your sales by making this decision for your buyers and this is one of the many reasons why our platforms increase sales by an average of 30%. "TruSky did an outstanding job! Made our website and eBay Store look amazing and in a timely fashion. Five star firm!" "TruSky was very helpful with bringing our eBay Storefront into conformity with eBay policy and also making it functional and aesthetic. Their hosting service is affordable and great that it includes updates based on the eBay platform as they arise. I'm very happy with their customer service and response times. Legitimate company at an affordable price. I would definitely recommend them to anyone considering updating or upgrading their eBay Storefront." Our stores outperform basic stores and our competition. Our focus is design, however it’s even more about functionality and usability. Giving your buyers the ability to navigate successfully will increase your sales. Our sites increase sales by an average of 30%. Let me tell you a bit about our design system… We focus on eBay SEO, meaning your actual search results within eBay which is where 98 percent of all your traffic comes from, is raised because we use code to hide any meaningless text and code within your template. We also create a unified shopping experience by filtering your store through our dynamic design system meaning every page looks the same, has the same navigation and search features, instead of just a fancy home page like most eBay Designers offer. When buyers reach one of your products it happens 98% of the time through the eBay search. The problem with default eBay templates is primarily that they lack usability and functionality that allows and encourages a user to stay within the realm of a store. A customer might happen upon one of your items, but it’s not exactly what they were looking for, it’s the wrong size, model, color, ect. Or perhaps they want to continue browsing in case there are items they would like better. By default an eBay user is trained to scroll back to the top of the page and search again. Our sites have increased functionality and a unified experience that encourages, and makes it more fun for a user to stay within your store. eBay is constructed much different than modern eCommerce applications. 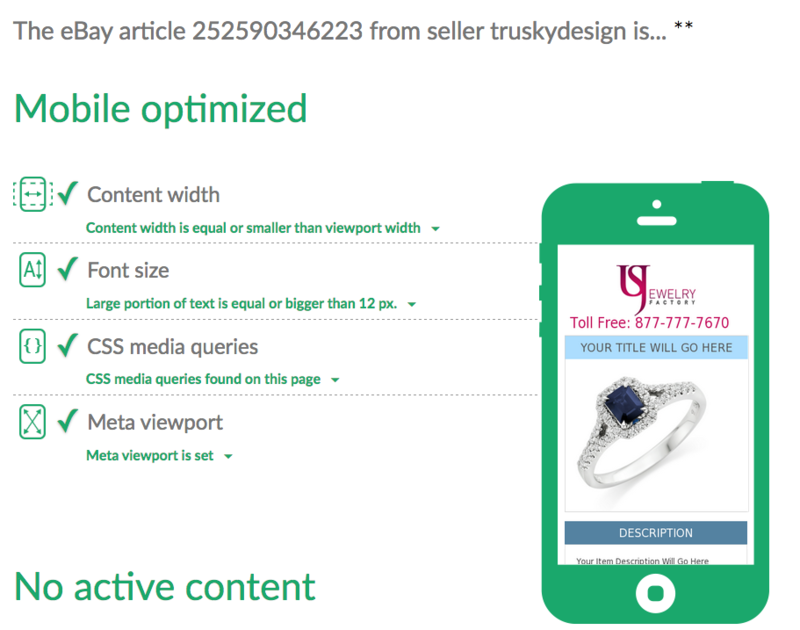 Because of this there are various issues that arise when developing an eBay Template. Ebay templates commonly contain links to all of your categories, custom pages, and informational policy text. The problem with this is because of how eBay searches through titles and description text when looking for items when a user performs a keyword search, there is no way for eBay to discern the difference between policy or navigation text and text related to an actual product. This creates a multitude of problems. Firstly it creates an issue eBay calls “Keyword Spamming”. Keyword spamming happens when your template contains text that does not pertain to your actual item. For instance if you’re an automotive seller, who sells tires, and spark plugs. If your item is a tire that fits a 2006 Cadillac, but your auction template contains a text-link to your spark plugs category, a search for “2006 Cadillac spark plug” would still return that item as a positive result. This is an issue for usability and also decreases your rankings in eBay search engine page results. One of the primary elements to the eBay search algorithm is determined by how much text is related to the keyword search. By using special coding techniques we pull areas that are not important to your actual item, but still important for usability, out of an external file. This serves two great functions. A) It raises your position in eBay Search Results. B) It allows for you to update your policy information, and store navigation, in one file, reflecting the changes across ALL LIVE LISTINGS even if you have tens of thousands.